Define recurring budgets. The templates allow you to load complete offers, invoices or project estimates in one simple step. Open the project with the existing budget. On the Budgets page, in the budget list, choose a budget. 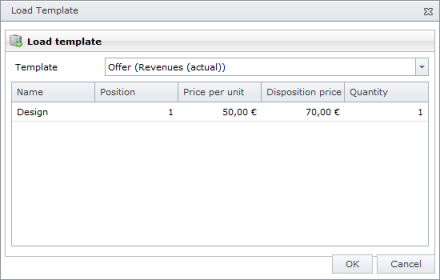 On the Budget Position tab, in the Template group click Load Template. In the Load Template dialog box the included position of the templates are displayed. In the Template drop-down list choose a name of the template. Loading a budget template | InLoox PM 7 Web App • Copyright 1999-2019 © InLoox GmbH. Tous droits réservés.